Yesterday was a day of blue sky and above freezing temperatures. The world around us responded emphatically. It seems only fair. The winter storm that rolled over us last weekend came with its own significant emphasis. 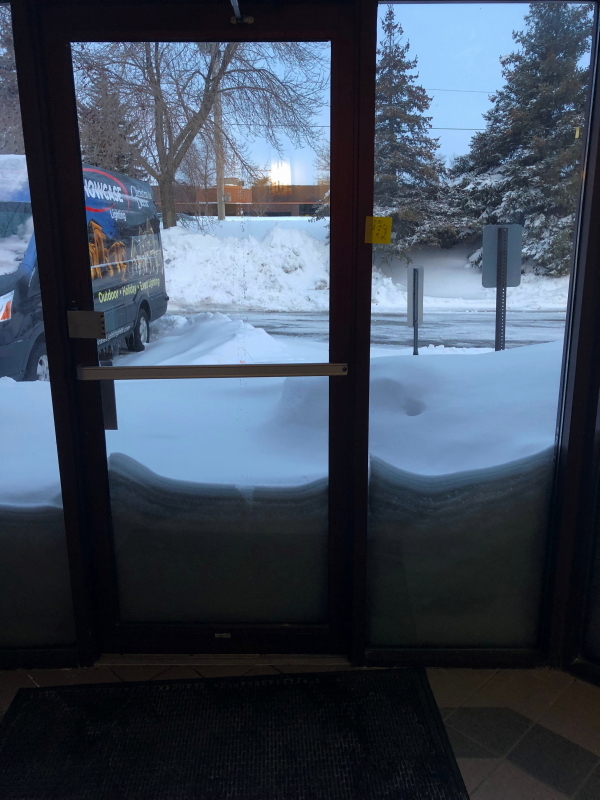 When I got to work on Monday, I was greeted by a three-foot drift that filled the sidewalk to our front door. 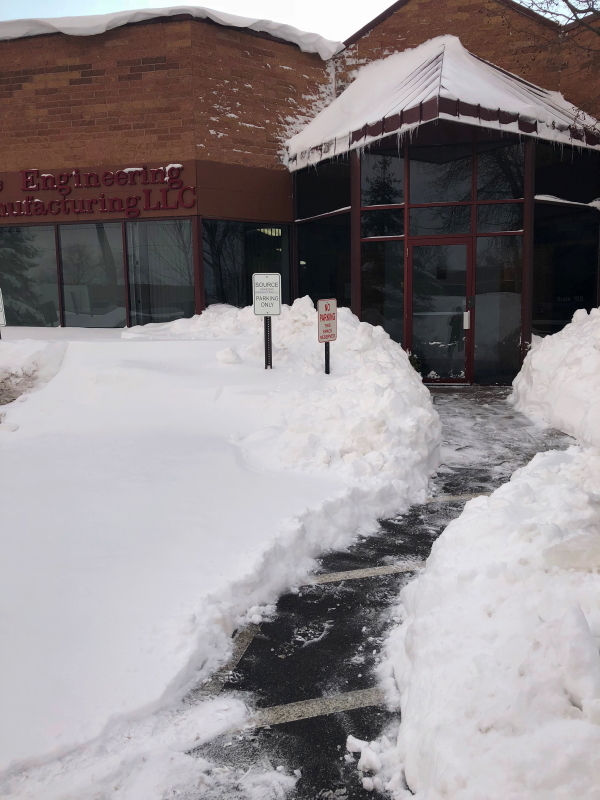 I needed to shovel my way into work. Yesterday’s swift melting was spring’s perfect response to the double-digit blast of snow. 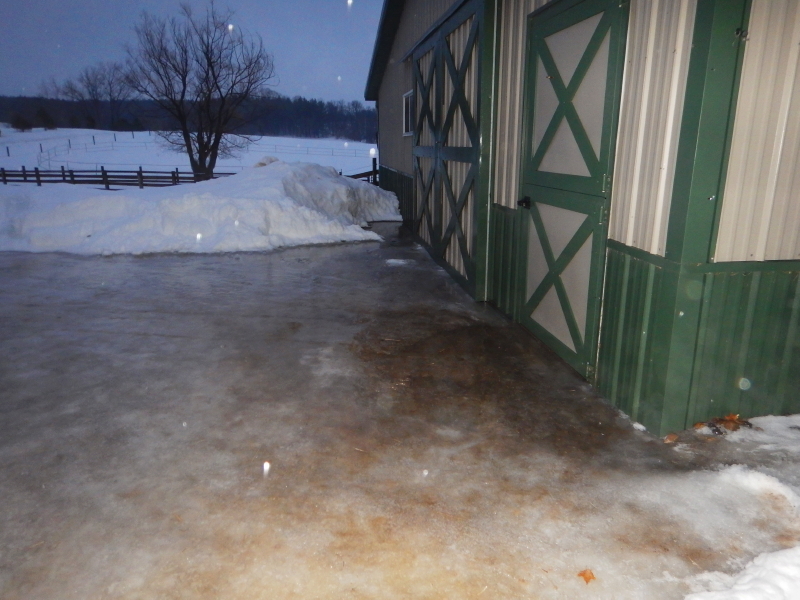 The metal roof of the shop-garage is always a source of creative snow-melt. 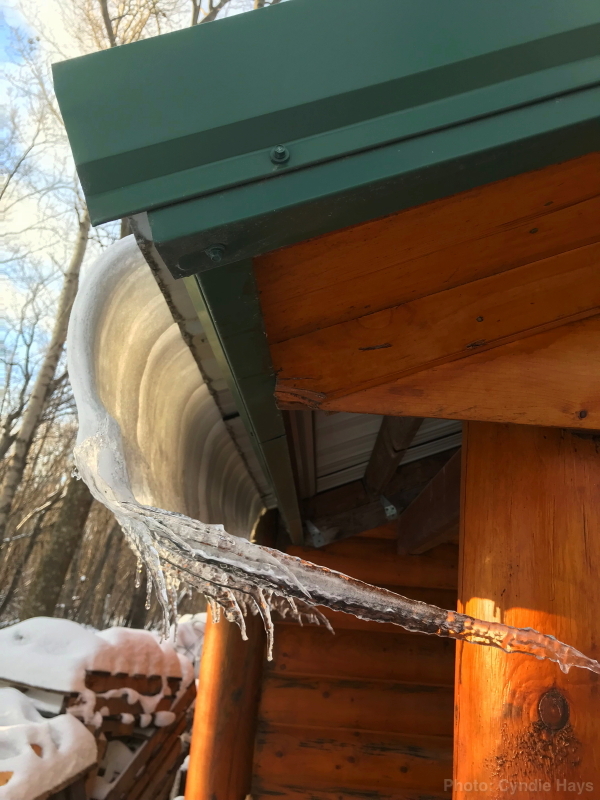 Before the large icicles had a chance to break off the edge of the roof, the entire mass of snow lost grip with the roof and slid down, curling as it rolled over the lip. The sideways icicle made for a spectacular visual. 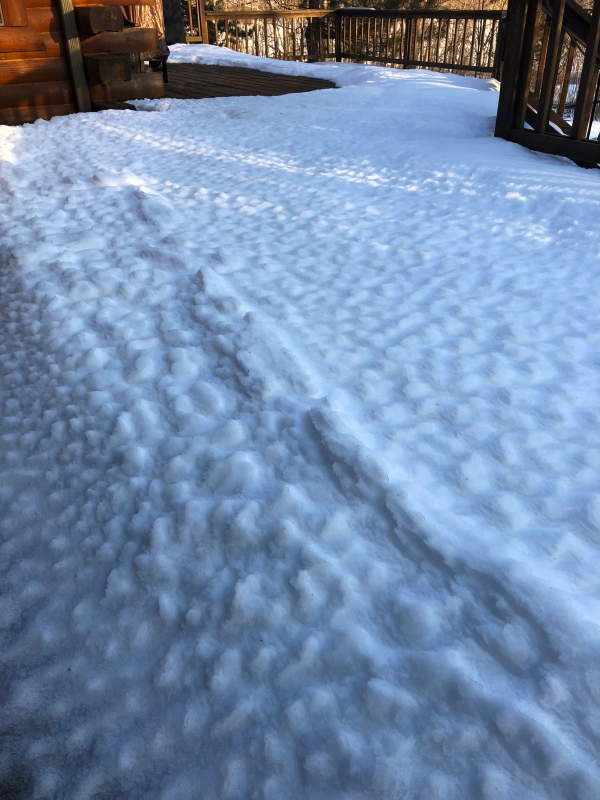 As the sun headed for the horizon, I spotted the withering snow mass covering the deck. 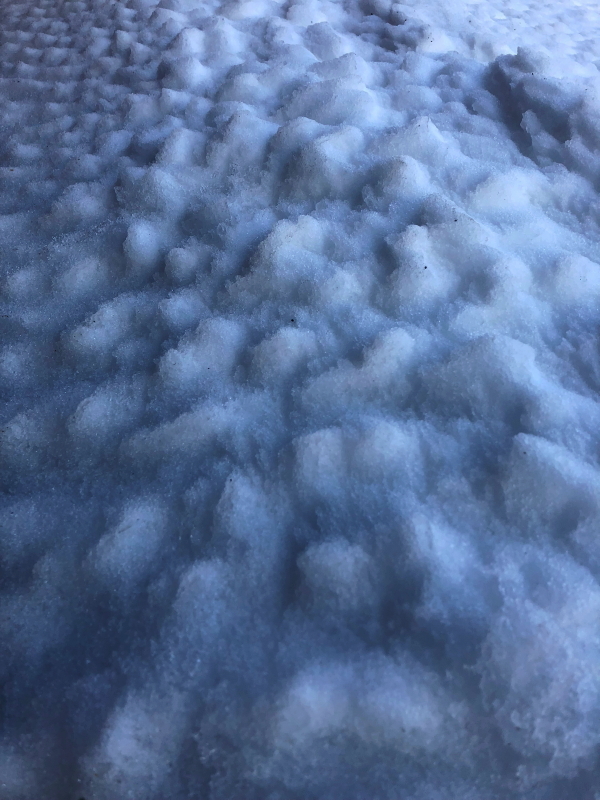 I have no idea why the snow melted the way it did, but it became a blanket of patterned bumps that I have never seen before. Turn the image upside down and it could be a mammatus cloud formation. It didn’t feel possible last weekend, but I do believe spring is going to finally respond to the earth tilt that is lengthening our hours of sunlight. Yep, we are finally getting a quick melt to this very long, slow winter. At this point, I’ll gladly take it. 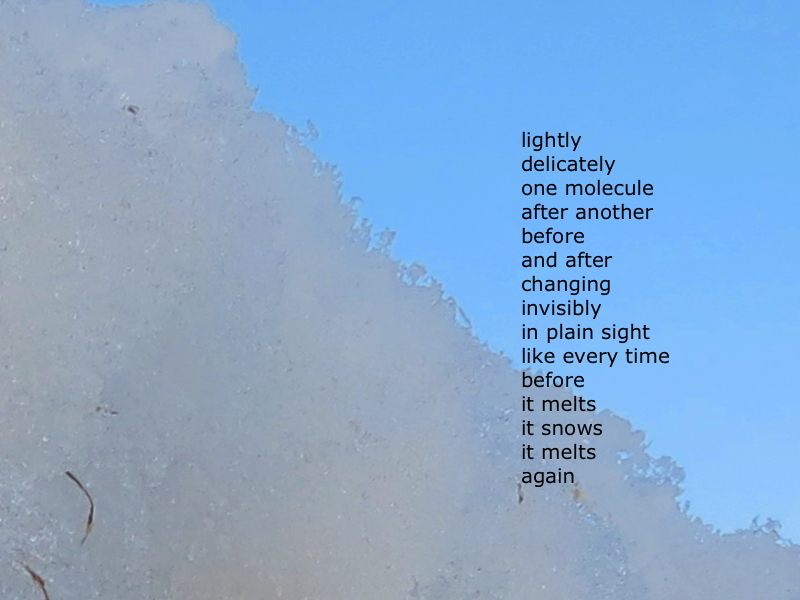 At the rate the transition from winter to spring has been playing out this year, this Words on Images post from April of 2013 resonates enough that I’ve decided to give it a fresh viewing. The prolonged cold and snow is getting mind numbing, but the change will eventually swing through to fruition. At least, that’s what we keep telling ourselves. In a short few days we have moved from below-zero bone chilling cold to above freezing high temperatures. 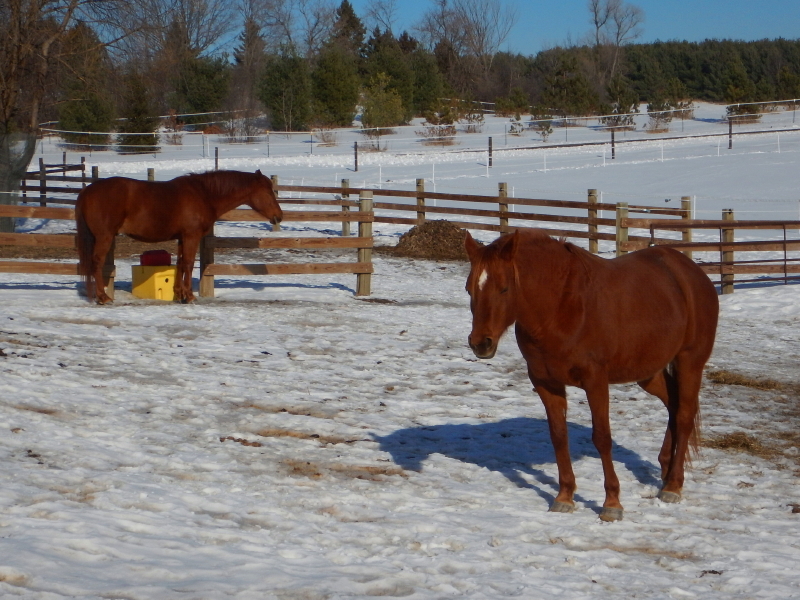 On Friday I removed the blankets from our horses and brushed out their shedding coats. The prediction is for a string of days with high temps in the 50’s° (F) this week. For each day that new bare ground becomes exposed due to loss of snow cover, the odds improve for the air temperature to increase. That snow on the ground acts as a natural cooler, so even though the sun shines bright, the breeze flowing across the white landscape remains chilly. 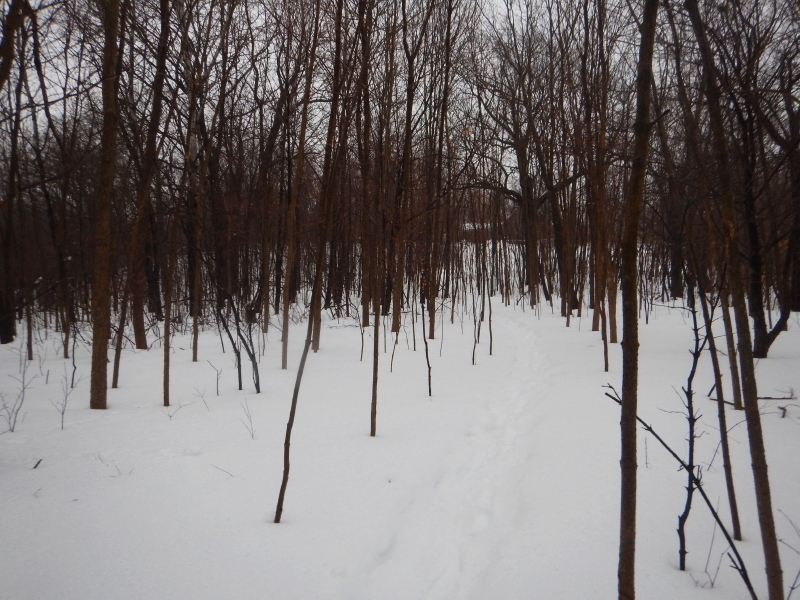 Once the snow is gone, the ground warms significantly and the air then follows suit. The horses were quick to soak up the direct rays after their blankets came off, which put them in serious napping mode. I think Hunter was planning on getting a drink, but then just fell asleep when he got to the waterer. Our friends, Barb and Mike arrived Friday afternoon for a sleepover visit, making the weekend feel like a holiday to us. We consumed massive amounts of all too sweet calories (think, Cyndie’s gooey caramel rolls and puppy dog tails, along with some birthday cake and chocolate covered strawberries), walked the labyrinth and wooded trails in the moonlight, communed with the horses, and enjoyed an extended visit with neighbor, George Walker. We wanted to connect George with Mike so they could talk “flight-speak.” George is working on getting his pilot’s license, when not trimming horse’s hooves or tending to their CSA farm. To the rest of us, much of their conversation sounded like a foreign language with the acronyms and specific phraseology. I was able to enlist Mike’s adventurous energy to help work on cutting down a long-dead tree limb that was hung up in the “Y” of an adjacent tree. We got most of the easier portions down, but the main trunk turned out to be too much for the rope-saw I was trying to use. We couldn’t get the rope-saw to orient over the trunk correctly, teeth down, and in our unsuccessful effort to forge ahead with hope it would eventually get a bite and right itself, the connecting cord between the chain and the one handle began to fray. All we did to the tree was rub the bark off that spot. 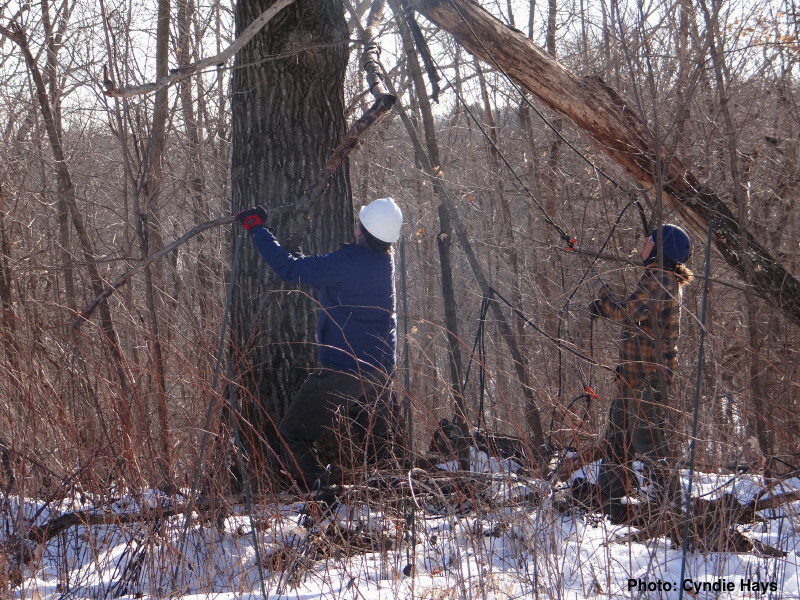 I went to get my pole-saw and we took down the smaller branches we could reach, leaving the main trunk for another time. Probably a time when I talk to George about borrowing that state-fair chainsaw. Today we are off to visit Elysa’s house to help with a bit of spring cleaning. I won’t be around to witness how the second day of big melting progresses. I expect to be shocked at how much ground becomes exposed, though that will be thrilling, too. I need the ground to warm enough to thaw out the drain tile we had buried last fall. That has my full attention this spring, in hopes of learning whether we will achieve the improvements we seek. Happy (grumble, grumble) Daylight Saving Time day.